The political power couple set their sights on the future, answering the burning question "what happens next?" 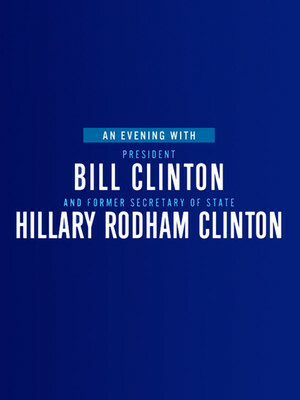 Why See An Evening with Bill and Hillary Clinton? 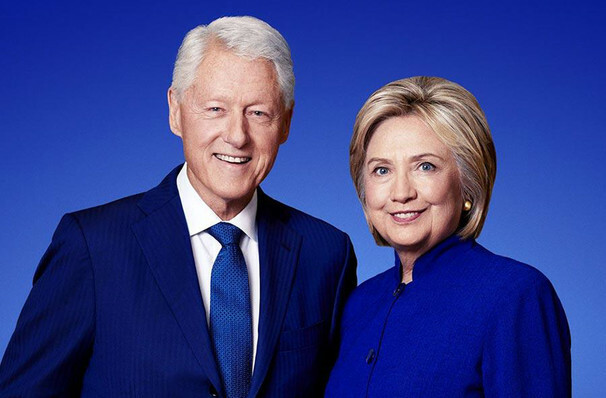 Undoubtedly one of the most influential power couples in recent political and cultural history, Bill and Hillary Clinton are taking their cue from Jay-Z and Beyonce and launching a double headlining arena tour! In an illuminating evening of conversation (not a concert, but you never know, Bill can play the Sax,) the Clintons will talk us through their opinions on their careers, achievements, the world today and the future we're facing. Overtaking her husband's profile in recent years, former first lady Hillary spent four years as Secretary of State to President Obama, and came close to taking the Presidency in the 2016 elections before losing in a highly controversial competition to Donald Trump. Since then she's taken to the road in series of high profile speaking engagements and released a memoir; 'What Happened', exploring how she found being the first female presidential candidate in the most dramatic campaign in modern American History. President Clinton served the United States for eight years during a time of unprecedented prosperity and change. Now a powerful voice for progress around the world, he also turned novelist, releasing a political thriller with the author, James Patterson in 2018. Sound good to you? Share this page on social media and let your friends know about An Evening with Bill and Hillary Clinton at Fox Theatre.